9.Јe2. Seems somewhat awkward. But 'harmonic' developing of the queen to d2 had been known as promising great troubles still before Tsushima battle and Port Arthur defense – 9.f3 Ґe6 10.Јd2? ¤xe4! 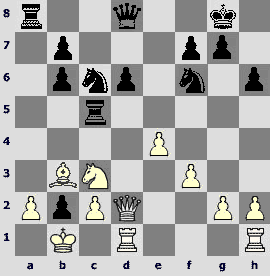 11.Јf4 ¤g5 with extra pawn (Alapin – Janowski, Vienna 1898). 9...0–0. 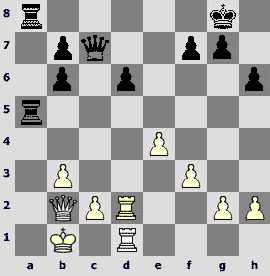 A 9.Јe2 plan with eventual 0–0–0 has been invented by Bulgarian grandmaster Ivan Radulov. However, he considered it as a 'frightening action' rather than prologue to a fight – both his games lasted less than 20 moves: 9...g5 (chess classic Vassily Smyslov began by 9...Ґe6, but resolutely moved g-pawn by next move already) 10.Ґg3 Јe7 11.0–0–0 (11.h4!?) 11...Ґe6 12.f3 (12.¤d5!?) 12...0–0–0 13.Ґf2 d5 14.Ґxb6 axb6 15.exd5 ¤xd5 16.¤xd5 Ґxd5 (16...¦xd5 17.¦xd5 Ґxd5 18.Јxe7 ½–½, Radulov – Smyslov, Hastings 1972) 17.Јxe7 ¤xe7 18.h4 c5 19.¤d2 ½–½ (Radulov – Matulovic, Skopje 1972). In the following years Black, except immediate driving back bishop, many times tried 9...Ґe6 10.0-0-0 Јe7 and 9...¤d4, but the natural move by Morozevich one can formally call a novelty. 13.Ґf2. 13.a4 justifies in case of 13...Ґxb3 14.cxb3 ¤b4 15.f4 или 13...¤e5 14.¤d4 Ґxd4 15.¦xd4 ¤g6 16.Ґg3. 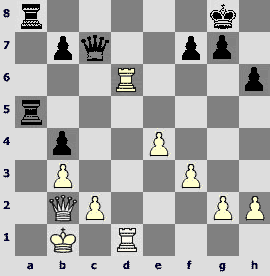 Yet after 13...Јe7 14.g4 Ґxb3 15.cxb3 ¤b4 events are moving to Black's profit. Undoubtedly, the vast majority of grandmasters would prefer 14...Ґxc5 15.Ґxc5 ¤d7 with good play, and they would be... right! By the way, both 'Rybka' and 'Fritz' would agree with them fully. Indeed, why one would unrecoverably destroy his pawn structure for the sake of very doubtful weakening of White's king protection?! What of all reasons caused such unexpected choice of Morozevich? Certainly, Alexander saw the obvious alternative and valued it as quite positive for Black. But, when deciding, he wanted to make not the objectively strongest move in the position but to 'sway the boat' first, to direct 'ship of a game' to a see of surrealistic imbalance where there are no Euclid geometry rules, no usual criteria, and, consequently, a cost of any inaccuracy grows heavily. 17.Јd2. Unexpected 'exotic' move 14 was confirmed by accurate calculations. 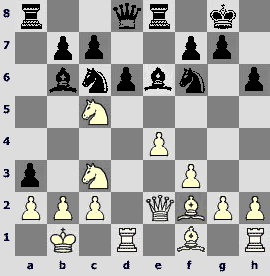 For 17.b3 Alexander prepared 17...d5! The main line is as follows: 18.¤xd5 ¤xd5 19.¦xd5 Јf6 20.c3 (20.c4? ¤d4! 21.Јe3 ¤xf3! or 21.Јd2 ¤xb3! 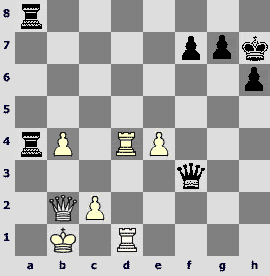 winning) 20...Јxc3 21.Јd2 Јf6 22.Ґc4 ¤a5 23.¦c1 ¦c6 with mutual chances. Ivanchuk has moved his bishop to b3 and cemented defects of his king cover. – And you, Alexander Sergeevich, what would you do now with 'former grandeur splinters'? – I sighed sadly, seeing at three black pawns in single file. 20.¤a4. In case of20.ўxb2 ¤e8 21.¤d5 Black could try, using the position of c5-rook, to prepare to land on c4: 21... ¤e5 22.Јd4 b5 23.¤e3 Јa5 with initiative. 20...¦ca5 21.¤c3. Non-obvious dynamics of the opponent's pieces seemed to confuse Ivanchuk. 22.¤d5 ¤e5 23.Јd4 ¤d7. 23...b5!? 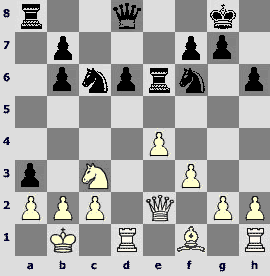 24.¤e3 ¦5a6 was of interest, both 25.Јxb2 ¦c6 and 25.ўxb2 ¤c7 26.f4 ¤c4+ 27.¤xc4 ¤e6 leading to perspective positions for Black. 25.¦hd1? Ivanchuk could not stand strain and made an inaccurate move, its cost turning out very high. It was necessary to keep the opportunity of taking by c-pawn in case of exchange on c3. After 25.Јxb2 ¤xb3 26.cxb3 ¦xa2 27.Јxa2 ¦xa2 28.ўxa2 ¤c7 29.¦c1 ¤xd5 30.¦xd5 Јh4 chances are nearly equal. 25...¤xb3 26.axb3 ¤c7! Forced marchof white king after 26...¦a1+?! 27.ўxb2 ¦8a2+ was not dangerous: 28.ўc3 ¦xd1 29.¦xd1 ¤c7 30.¤xc7 Јxc7+ 31.Јc4 Јe7 32.¦d5. It is difficult to believe, but White has very hard position already. 28...b5! 29.¦xd6. 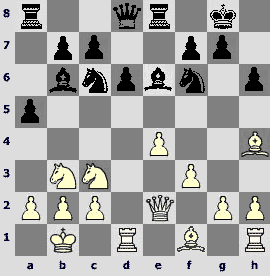 Even computer programs need several minutes to understand that Morozevich has no intention to exchange his active rooks for white queen even taking c2-pawn in this case. 'The goal of the chess game is to checkmate the opponent's king'. 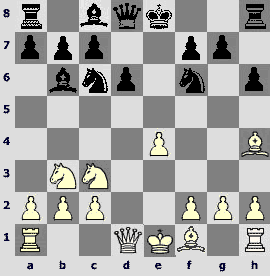 Black's plan is: ўh7, Јc3, ¦a1#. 30.¦d7. Passive defense could not help: 30.g3 ўh7 31.¦6d3 (or 31.¦1d3 ¦a3!) 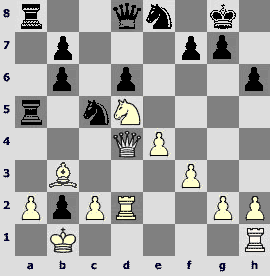 31...b5 with fatal penetrating of the black queen to a-file. 35.e5?! More persistent was 35.Јb3 Јe2 36.ўb2. 35...Јe2 36.¦4d3 h5 37.b5 ¦a1+ 38.Јxa1 ¦xa1+ 39.ўxa1 Јxe5+. White resigned.